Depicted here is the story of the Good Samaritan (Luke 10:25-37). But is it really this Good Samaritan that the parable is about? When we read the text closely, we discover that the story is told from the perspective of someone else. We see through the eyes of the man who in this pastel drawing is lying at the bottom on the left: the victim of a robbery left for dead at the side of the road. Feebly his head is hanging backwards. His eyes are shut as if belonging to a dead man. His blood is dripping down his body. Jesus’ question is a counter-question in reaction to the lawyer who questioned him: ‘Who is my neighbour?’ The lawyer asked this question in connection with the great commandment:‘You shall love the Lord your God above all else and your neighbour as yourself.’ But who is my neighbour? Just anybody? Jesus surely does not demand that we love everybody? This is definitely a realistic question. In the parable of Jesus he is, however, not the one who has something to give. He cannot recognize himself in the priest or the Levite and certainly not in the Samaritan. The only one left is the man who fell in the hands of the robbers. ‘That could be you,’ Jesus tells him, a person who is unexpectedly brought down by a robbery or accident, illness or depression. You lose your job or worse, someone you love. It can happen any moment; we are vulnerable people. And who is my neighbour when disaster strikes? Strangely enough it all of a sudden is no longer a question. Of course it is the one who does not abandon me. And I could not care less about the colour of his skin or the line of his descent. Who will take care of me? In the drawing we look through the eyes of the victim at the back of the priest (in the upper right corner). He has quickly turned away. We see the averting movement of his back in his raised shoulder. Besides him we see the Levite who is turning his eyes away from us. He is covering his mouth with his mantle out of fear of contamination. Their frightened poses tell us that they have suddenly realized that if they had been there just a bit earlier, they would have been victims themselves. And in a reflex, confronted with their own vulnerability, they hold on to their busy, important existence: their liturgical role in the temple which they can only fulfil if they keep themselves clean and do not come into contact with death and decay. But the Samaritan dares to look death in the eye. It makes him sick too. It literally says in the text that his insides turn around inside him. It is compassion that pulls him irresistibly towards the victim. In the drawing he carefully lifts the head of the man with his one hand, while bending over him, hoping for a sign of life. With his other hand he tries as it were to catch the drops of blood, the life that is slipping away from the man. Everything in him is focused on saving this fellow man’s life, as if it were his own life. 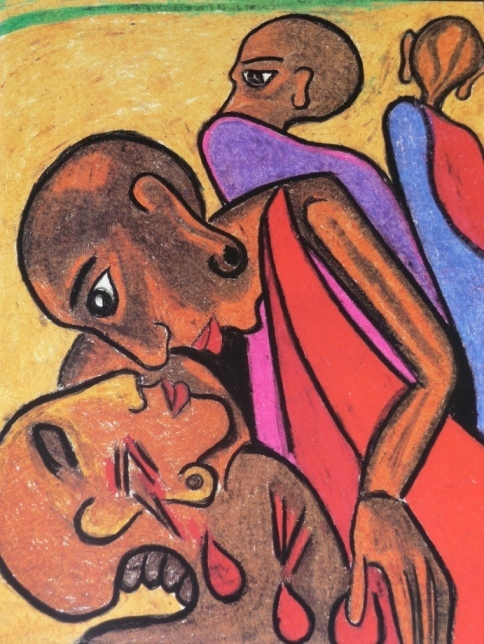 Karin Kraus:The Good Samaritan, 29 x 39 cm, pastel drawing in the Masai-Bijbel, tekeningen van een Afrikaans volk, Standaard Uitgeverij – Antwerpen, 1987; Die Massai-Bibel, Belser Verlag - Zürich Stuttgart, 1985; La Bibbia Masai, Jaca Book – Milano, 1985. During the 80’s Karin Kraus worked at a mission post in Handeni, Tanzania, a small market town at the edge of the Maasai steppe. Before this she had worked in Ndanda in the south of Tanzania, but had returned to Europe to study veterinary medicine in Freiburg, Germany, so that she would be able to help the Maasai as a veterinarian and come in closer contact with them. The lifestyle and faith of the Maasai are remarkably alike those of the old people of Israel, that we know through the stories of the patriarchs. Just like Abraham, Isaac and Jacob they are nomadic shepherds with large herds of cattle. They worship only one God, Engai. He is the one, almighty and all-knowing Spirit, without body or human form. He is the creator of all that lives. It is quite exceptional that they do not worship their ancestors. According to tradition they come originally from the north. Due to lack of space and grass they kept on moving further southwards. They had been shepherds of the pharaoh and journeyed through Egypt, Sudan and Ethiopia when they found large grazing areas for their cattle in Kenya and Tanzania. According to some ethnologists their origin lies on the Arabic peninsula. Conjecturally they originally were Semites, just like the Israelites. As the similarities with the world of Abraham were apparent to Karin Kraus, she tied in with the biblical stories of the patriarchs. And as she did not speak the language of the Maasai very well, she made pastel drawings that portrayed the stories in the context and colours of the Maasai. Black, for instance, is a holy colour and the colour belonging to festivities. Red is the colour of youth and masculinity. White is the colour of purity and repentance. Next she moved on to stories in the New Testament such as the parables of the Good Shepherd and the Good Samaritan. Printed in postcard format they played an important role in the catechism lessons at her mission post. In September 1982 Karin Kraus took part in a mission conference in Nairobi about mission to nomadic tribes. There she was asked to make her images also available to the neighbouring countries. In this way a collection was put together of 70 big plates printed on cardboard. In this way a great number of tribes in East Africa could be reached.